Here is the Locke Tavern, Andover, MA. It is thought to have been built about 1740, maybe before 1700, expanded about 1790. George Washington stopped for breakfast here on his Farewell Tour. 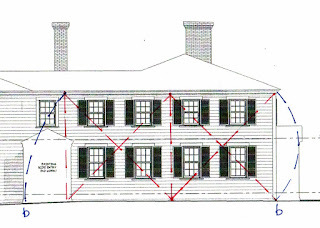 The measured drawing is the first floor plan of the original 1740 house: 3 main rooms with a center chimney, and a rear lean-to. 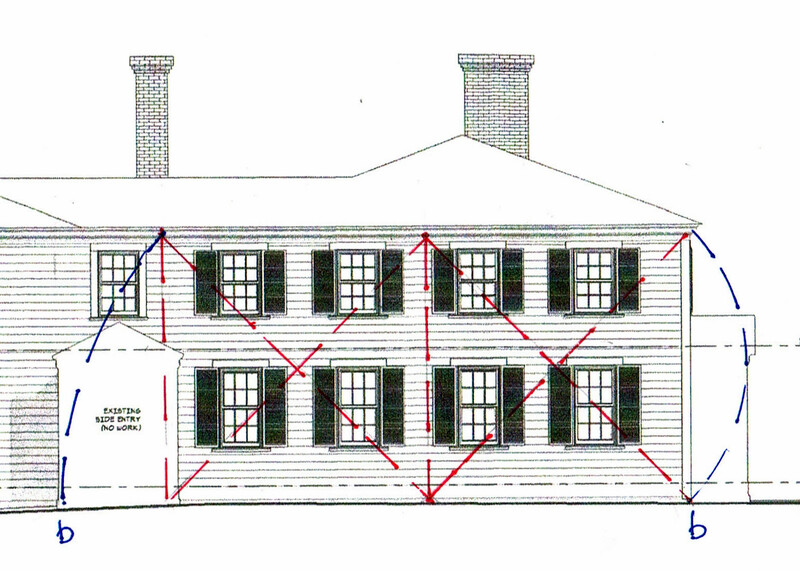 I show here the way I believe the 1740 house was laid out: in three squares - drawn in red. It is a very straight forward design. 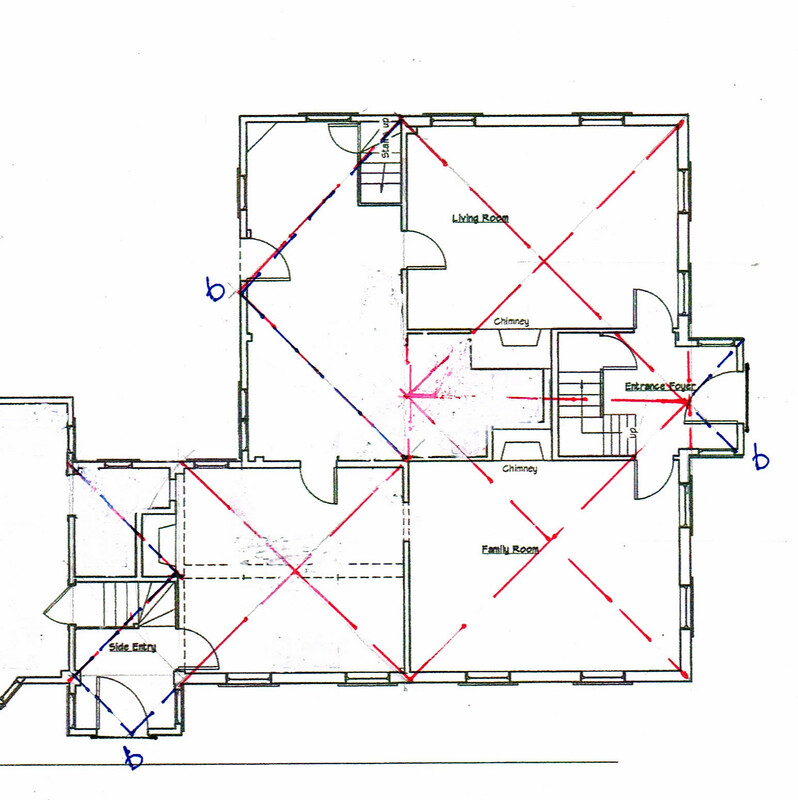 The room shown by the blue squares - shown by their diagonals and marked 'b' - may have had a salt box roof on that side with a third fireplace leaning against the main stack. It has no basement. Many similar houses have basements only under their front section. Back sheds like this regularly morphed into living spaces. The house reflects what I see here. The moldings and framing, the low ceiling, central chimney, front stair, the tight space between the roof and the second floor windows, are typical of 1740 construction north of Boston. The small rear space has been upgraded many times. As the house is repaired more information may be uncovered. If so I will add it here. The basement follows the original footprint. The stone work under the wing - the smaller square to the left - is part of the original house. The only concern for me is that the fireplace in that room and its chimney are outside the shape. Why? The elevations show the same pattern - squares for the 1740 layout - the diagonals marked 'a'. The squares leave space for the front door. I thought a square with sides the same length as in the floor plan might be used for the height, but that length doesn't work. 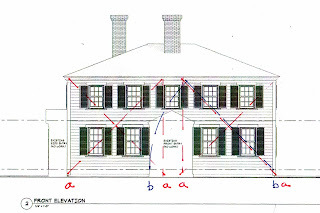 How was the size for the new 1790 front entry determined? The diagonal of the square was extended on both squares. The space between them gave the width of the entry. For clarity I have drawn only one (marked in blue with 'b'). The dimensions across the base, marked 'a-a' and 'b-b', are the Golden Section. I find myself delighted to see that the additions were proportional to the original design. The 1790 improvements included changing the roof to a hip from a gable. The chimney stayed where it was, of course. The ridge which needs to be in the center of the roof moved from in front of the chimney stack to behind it. The front entrance and side entrances with classic columns and pediments, the rear rooms (second floor) were added. Larger windows replaced the originals - inside they feel almost too big for the rooms. 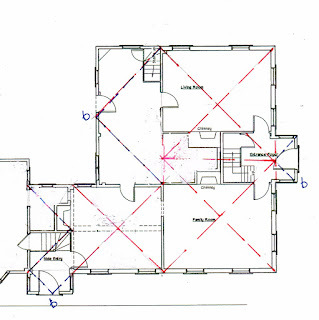 Here on the side elevation the squares - in red - and the diagonal - 'b' in blue, left - determine the size of the entry and back closets, maybe the fireplace as well. I have drawn in an arc - 'b', right - determined by the center of the square which includes the depth of the front entry. For me this dimension is problematic: I've not encountered its use on other houses. The rear wing - not shown - is one part later addition, one part building moved to the site. The proportions aren't the same. It has also been greatly remodeled which is common with many houses built before central heating and plumbing.